The top of the bell, installed in 1841. Cast in East Medway, Massachusetts by George H. Holbrook. Shows solid oak head stock, made in 1984. Counter weighted with a granite slab and iron bars, which were put in to slow the swing of bell. Weighs 1200 pounds. The capstan with the driving mechanism that runs each side of the clock (there are four clocks on the steeple). The needle pointing to 30, shown here, makes one revolution per hour. If the clock needs to be set manually, the Keeper goes up into the clock tower and adjusts these gears. Bell in the clock tower at the Peterborough Unitarian Universalist Church. Prior to the telephone and Internet, the bell was used to signal fires, births and deaths in the town (six tolls for a woman, nine for a man). The clapper that rings the bell weighs 125 pounds. The first one that was installed couldn’t be synchronized, so a second had to be recast. One of the two bell strikers that are operated by ropes in the vestibule. The clock mechanism that makes the bell toll every hour was purchased in 1856 by funds raised by The Clock Festival, which organized by a group of civic minded women in Peterborough. It was replaced in 1947. A member of the PUUC organization was designated “Keeper of the Clock”. Richard Johnson was the Keeper for 20 years. Ed Morrow took over in 1993 and continues in that role today. 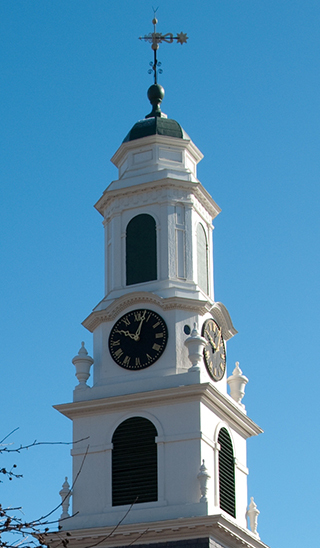 The clock in the church steeple was purchased and installed in 1856 with money raised by a “Clock Festival” organized by a group of civic-minded women in Peterborough. Having a town clock is a matter of pride to the citizens in New England towns. The clock undoubtedly served the practical purpose of being the commonly agreed upon time for townspeople. When the clock was yoked with the church bell, it called people to work and to supper. In the steeple below the clock is the church bell, originally installed around 1841. The bell weighs over 1200 pounds, and was cast by George Holbrook of East Medway, MA. Before telephone and Internet the bell was chimed to call volunteers to help put out fires or respond to a disaster. It was tolled to notify people of a death in Peterborough, three tolls for a child, six for a woman, and nine for a man.